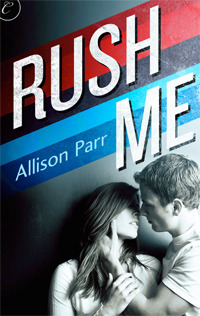 I will admit, I liked the cover of Allison Parr's debut novel Rush Me right off the bat when I first saw it floating around the blogosphere. I could tell it was going to be marketed new adult as soon as I saw it, and that's probably a marketing win right there. But the reason I liked it was because everything I knew about the book seemed to come together in the cover. The bold stripes of color and the font work really well for this sports romance. I particularly liked the colors set across the black and white photo, and that the couple was sort of naturally or ordinarily presented (and attired). It was both a relief and an eye-catcher, if you will. I still waffled back and forth a bit on picking it up until I read Li's review over at Me and My Books. In it, she compared it to another new adult title she'd read and found this one to be decidedly preferred. Li has excellent taste, in case you were wondering. And so that (and the extremely attractive price) was all it took to push me over the edge from waffling to buying. Rachael can't seem to gain any traction. She took the unpaid internship with a small-ish publishing house in the hopes that it would open doors to a career in the industry. But it seems she's just biding her time, blowing through her savings, not getting anywhere. The same could be said for her love live, or lack thereof. These days the only kind of social life she engages in is when her roommate Eva drags her out with her gaggle of fellow theater friends. Which is how Rachael finds herself one night in the wrong apartment at the wrong party. Surrounded by a host of men too brawny and women too clingy to be Eva's crowd, she realizes she's crashed some sort of sports-related party or other. Infinitely outside her comfort zone, she attempts to beat a path out of there. Unfortunately, said path is barred by a couple of bruisers who assume she's just another in a long line of groupies. The situation devolves from there. Utterly disgusted, she walks out without her scarf. And it's a nice enough scarf that she's forced to return to retrieve it. And wouldn't you know in the cold light of day, some of those big, bad football players don't look all that big and bad. They invite her in. They're interested in what she has to say. All but Ryan Carter. The star quarterback is convinced she's there for one reason and one reason only. He wants her gone in no uncertain terms. But by the time he makes his opinion known, the team has already sort of adopted her. And perhaps most surprising of all, Rachael finds herself . . . wanting to stay. The room's centerpiece, a seven-tiered fountain, obscured the flock. Bubbly champagne frothed downward as waiters reached out to catch the golden ambrosia. They circulated through the room with their balanced platters, passing by women in long gowns and men in black jackets. Murmured voices were underlain by the slightest whisper of classical music. Precious stones winked in earrings and cuff links, and guests appraised each other from behind their champagne flutes. A young woman in a red dress tossed a flirtatious glance at a young man on an older lady's arm, while two men huddled together in the shadows, trading secrets over empty glasses. People touched and parted, a dance of consequence, as everyone tried to break into circles higher than their own. "Ryan Carter wants to have dinner with me on Friday. And like a dozen other people. But still." I collapsed onto the sofa and kicked off my shoes. Eva frowned. "But aren't you in a fight?" "Yes. I don't know. Is this a really bad idea? Apparently he suggested it." Eva's grin broadened and her dark eyes twinkled. She peeled off the rubber dish gloves and dropped down next to me on the sagging cushions. "I think it's a great idea." "But what if he's a Wickham?" She shrugged. "Maybe you're a Lydia." I shuddered. "Don't say such things." Lydia might have caught Wickham in the end, but she was still vain and flippant and unlikeable. "I want to be Elizabeth." Eva gave me a look. "Fine." My head dropped against the back of the couch. "I'm a Jane. I'm a Jane, okay?" The staid older sister. "There's nothing wrong with being a Jane." "That's what the Elizabeths always say," I muttered darkly. What can I say? I appreciate a quietly tossed in Pride and Prejudice moment. In fact, I appreciated everything about this sweet, surprisingly grounded story of opposites attracting against a backdrop of professional football and the big city. Book Binge - "It wasn't hard for me to fall into this story, at all." Book Chick City - "This is one of the best New Adult novels I have read so far." The Bookpushers - "I adored Rachael and Ryan together, as well as separately." Dear Author - "Rush Me didn’t work even though I love football stories and love this younger contemporary romance setting." Me and My Books - "What I really liked was Allison Parr’s voice – it’s self-ironic and aware." Angie!!! I'm so pleased RUSH ME worked for you. I agree it was surprisingly (in a good way) more substantial than I thought it would be. That passage you quoted between Rachael and Eva made me smile too. I'm really looking forward to what Allison Parr writes next. Li!!! Thanks so much for that review. I just thoroughly enjoyed my time with this book. Like you, I can't wait to see what she comes out with next. Hopefully soon! The premise really grabs me, and your review is a huge help. This was totally my life out of college. Um, not the cute football players. I wish. But the making-next-to-nothing-at-a-publishing house aspect and feeling the pressure to go to law school!! But it sounds like you might really enjoy this one, Lin. OOO, I definitely need to look into this one. It looks like a lot of fun, and lately all I've wanted is contemporary romance books. Then this is the one for you, Quinn. Much fun. Great recommendation, I couldn't put it down this morning and started to re-read over lunch. Perfect light but not air-headed romance of opposites. A bit of a Cinderella in there with the NFL players, but I loved that. Oh, I'm so pleased it worked for you! I haven't talked to that many people who've read this one, but I feel like it has a potentially broad appeal. I was attractive to the book cover too! And glad that I found out this good review on RUSH ME! Thanks! Sold! I want to be an Elizabeth too. Football and romance AND some P&P? What! Count me in. It hits a rather lovely bunch of buttons. Angie, I just wanted to let you know I finished this book all full of happiness. I mean, I love a happy ending, but a snow-falling-Christmas-in-the-country is really ideal. :) And since our stint in Manhattan, I have an affinity for stories set there (happily, quite a few). I loved Rachael's academic snobbery, and the pathway she traveled in the book. Thanks for the recommendation! Jolie! I love it when you let me know you enjoyed something. This ending really was sort of happiness incarnate, wasn't it?